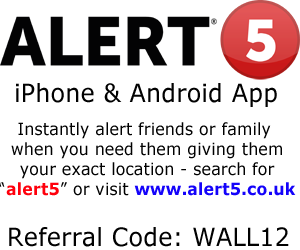 Alert5 is a very clever new iPhone app which alerts your friends, family and colleagues and the emergency services of your exact location using the GPS signals sent by your phone. The message it sends will let them know you need help and they will know what that means. Once you’ve entered your personal details this can all be done at the press of a button. “The benefits of Alert5® are different for each and every person. Regardless of age there will be a scenario that may arise where it would bring “Peace of mind” to know that at a touch of a button someone knows you are in trouble and need help. It’s quite simply, peace of mind in your pocket. Visit the Alert5 website for more information. You can download and test the app for FREE by searching for “alert5” on the Apple App Store and it’s also available for Android phones. If you continue on and buy the app for £4.99 per year, please enter WALL12 for the referral code and the App will then appear as shown in the images below. 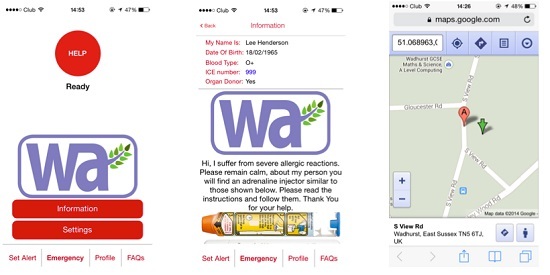 So as well as carrying two adrenaline auto-injectors wherever you go you should also download this app, it could be £4.99 very well spent. Has anyone got this app yet? Anyone actually used it?